It’s the beginning of the new year and most of us have already made our resolutions. Spend more time with family, travel, take a new class/learn something new, be organized or volunteer are one of the few resolutions some of us make. This year, in addition to your resolutions I would like you to add one more – help out the school in your community. And I’m not talking about volunteer work, but about clipping and collecting Box Tops for Education. This January, help Food Lion® promote their exclusive Box Tops for Education offer to help get even more cash for your school! 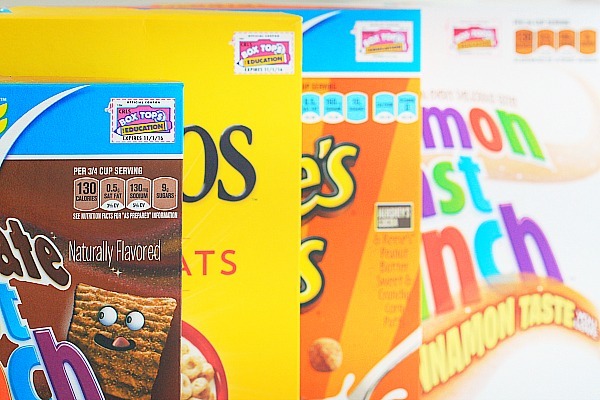 Get 20 Bonus Box Tops ($2.00 value to BTFE eligible school) when you buy ANY 5 participating General Mills® products in a single shopping visit using your personal MVP card between 1/7-1/13 AND be automatically entered for a chance to win 100,000 Bonus Box Tops ($10,000 value to BTFE eligible school). If you don’t know what Box top for education is, here’s how it works. Start by clipping Box Tops for Education. Hundreds of General Mills® products participate in the program (you most likely have already several in your pantry, freezer and fridge). For every Box Top you clip, your child’s school will receive 10 cents. That may not sound like a lot, but it adds up quickly. Each school can receive up to $20,000 per school year from clipped Box Tops. One of the most Box Top for Education products I buy are cereals. From a quick breakfast in the morning to making after school snacks, I have a few boxes in the pantry. 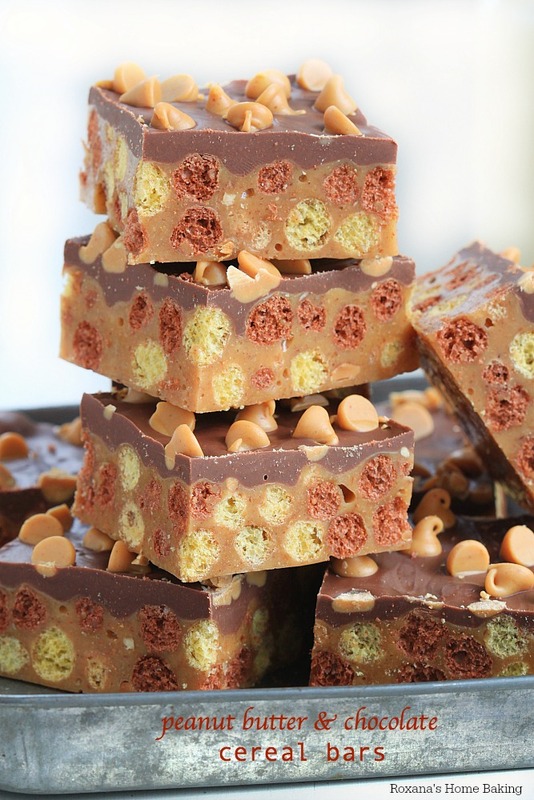 These peanut butter and chocolate cereal bars are our latest sweet treat. 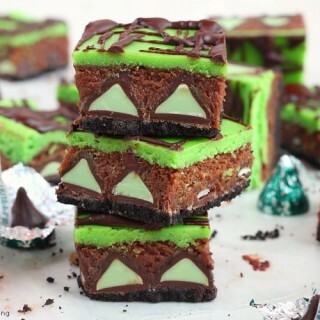 They require no baking and come together in less than 10 minutes. Line a 13X9″ baking pan with aluminum foil. Grease it. Set aside. Add the sugar and corn syrup to a 3qt saucepan. Heat over a medium flame, stirring occasionally until the sugar has dissolved and the mixture has reached a boiling point. Remove from the heat and stir in the peanut butter until well combined. Fold in the cereals are stir until coated. 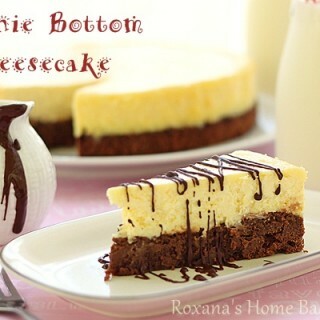 Spoon the mixture into the prepared baking pan and spread evenly, pressing with the back of a spoon. 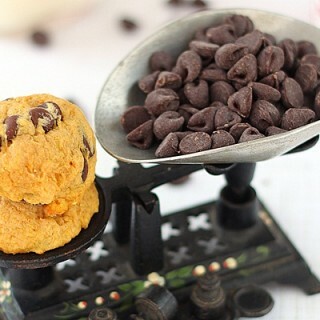 In a heatproof bowl, combine 1 cup of chocolate chips and 1 cup of peanut butter. Microwave, stoping to stir every 30 seconds until the chips are melted and smooth. Pour over the cereal mixture and spread evenly. Top with the remaining 1 cup of peanut butter chips. 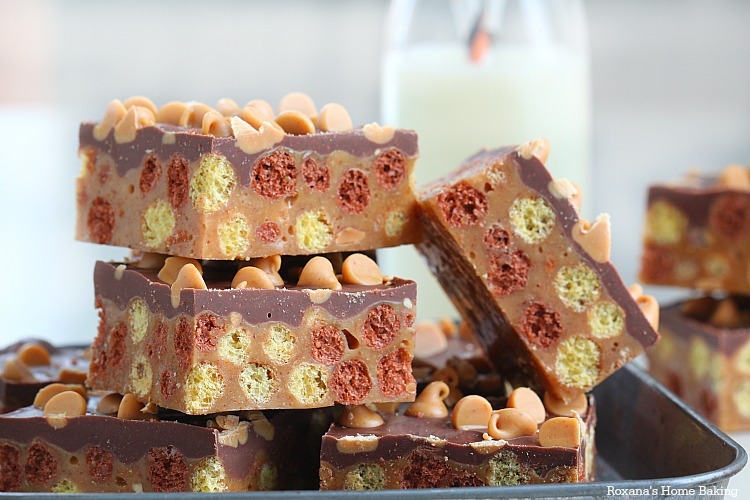 Set aside to coo completely before cutting into bars. I love Reese's Puffs. I out them in everything including my frozen yogurt. 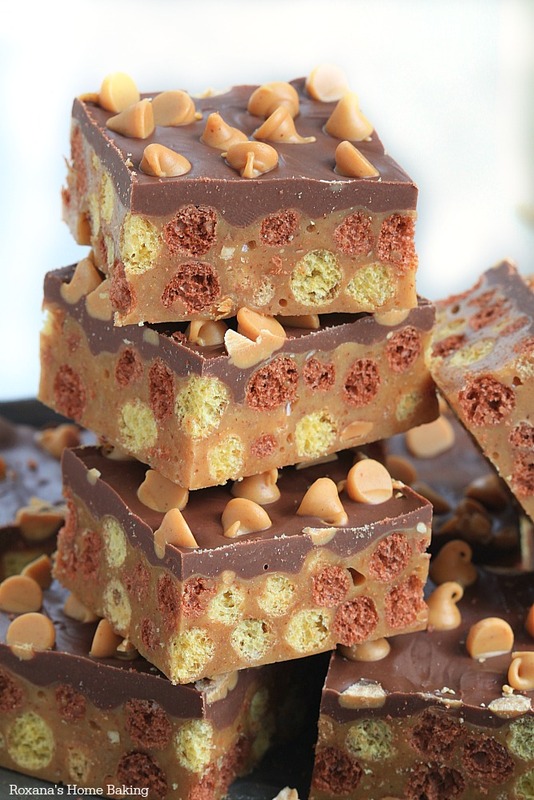 I love these bars but i would have to make them for church or company. i would eat all of them myself if I made them for home. i love General Mills Chocolate Cheerio and next time i might buy a box or buy a box of their fiber bars. I love both of them. Your recipe looks delicious and is so eye-catching. I'd use the gift card to buy Cinnamon Toast Crunch Cereal (my favorite!) and Cherrios.